Federal regulations require institutions of higher education to establish minimum standards of Satisfactory Academic Progress (SAP) for students receiving financial aid. Students receiving federal financial aid and institutional financial aid must meet both a quantitative and qualitative standard. The standards measure students’ performance in three areas: maximum time frame to complete a course of study, credit hour completion rate, and cumulative grade point average (GPA). The standards of academic progress outlined here are for the purpose of evaluating eligibility to continue receiving financial aid. They neither replace nor modify academic standards required for continued enrollment at Richard Bland College. Students are required to complete their program of study within 150% of the published length of the program. That is, as the Associates Degree program requires 60 credit hours to complete, the maximum number of credits attempted to complete the program cannot exceed 90 credits. Students who complete the academic requirements for an Associate’s Degree but do not yet have the degree are not eligible for further financial aid. Federal regulations require that students make steady progress toward degree completion within the maximum time frame. Progress is measured for all students by semester at the end of each term of enrollment by comparing the cumulative number of attempted credit hours against the cumulative number of credit hours earned. Students who have attempted 12 or more credit hours must complete 67% of all attempted coursework. Earned credit hours include a grade of A, B, C, D or P in a course and transfer credits. After attempting 12 semester hours minimum, students must have attained a cumulative grade point average of 1.50. After attempting 24 semester hours minimum, students must have attained a cumulative grade point average of 1.75. After attempting 45 semester hours minimum, students must have attained a cumulative grade point average of 2.00. Remedial coursework and transfer credits are not included the cumulative GPA; however, they do count towards the number of credit hours attempted. Progress is evaluated at the end of each semester. This review will determine eligibility for the upcoming semester. 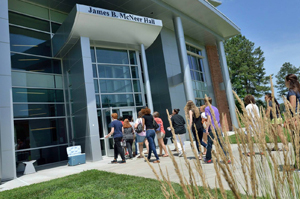 When assessing SAP, the College will review all terms of enrollment at Richard Bland College as well as transfer work accepted toward RBC degree requirements, whether or not the student received financial aid during those terms. Financial Aid Warning will be offered automatically to students who are not meeting satisfactory academic progress as long as the student was making progress during the previous term of enrollment. Students on Financial Aid Warning will be allowed to receive aid for the subsequent term – one payment period. At the end of the Warning term, students must be meeting SAP standards in order to continue receiving aid. Students who fail to meet SAP standards after a warning term are not eligible for federal, state or institutional financial aid, and will remain ineligible until standards are met. Students who exceed 90 attempted credit hours are not eligible for Financial Aid Warning and will be placed on Financial Aid Suspension and immediately be ineligible for financial aid. Students who are on Financial Aid Suspension due to failure to meet SAP standards and who have extenuating circumstances affecting their ability to meet the standards may appeal their status. Appeals will be considered for the following circumstances: a death in the family, serious personal illness or injury, or other special circumstances. Students who wish to appeal their Financial Aid Suspension must submit a Satisfactory Academic Progress Appeal Form. Properly completed and documented SAP Appeals will be reviewed by the Financial Aid Appeal Committee. Based upon the documentation submitted, the Committee will approve or deny the appeal. Students will be notified of the decision no later than one month after the completed appeal is received. Students awaiting review of appeals are financially responsible for any enrollment. A student with a denied appeal will not be eligible for federal, state, or institutional financial aid until he/she meets the SAP standards. The student will be financially responsible for their educational expenses. Financial Aid Probation lasts for one term of enrollment and the student becomes eligible for financial aid for that term. At the end of the term during which a student was placed on Financial Aid Probation, the student must meet the SAP standards in order to remain eligible for financial aid. If the student does not meet SAP standards at the end of a Financial Aid Probation term, the student is not eligible for financial aid until he/she meets the SAP standards. A student may be found eligible for financial aid based on an Academic Plan that outlines future academic progress for the student as established by the Director of Financial Aid. If the student fails to follow the Academic Plan, the student is not eligible for financial aid until he/she meets SAP standards.